Kid Durant is about to become Dr. Durant in my book! 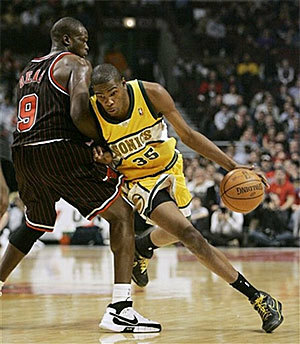 Not much time today IP fanatics, but I do want to make sure everyone realizes the gold mine that is named Kevin Durant. As I was watching the game last night it became obvious to me that this kid has everything, and I'm not talking about mad skills, I'm talking about his inner being. 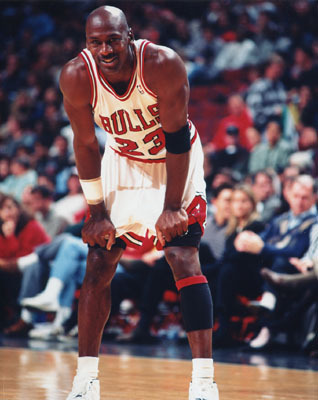 At any point in time, no matter who the other nine players were on the court, he had the most intensity, the most focus, and the most heart! Kevin kinda reminds me of a man I grew up watching. The whole package is tough to find in the Association. In what has always been deemed as a fun game to get the young stars on the court to showcase their game(and bring in another bucket load of benjamins for the Association), Kevin decided that he wasn't about that. Here is a kid that is in his second year, and maybe it is his freshness to the league, but he rose above the monetary vacuum of the Association. Kevin Durant, the inner being, simply said...dammit, I get paid millions to play this game, and all these fans pay hundreds to see me when they make less in a year than I make in a game, I have to go balls-to-the-wall all game, every game. And whether he was turning a steal into a dunk, or hitting clutch free throws down the stretch in a game that doesn't mean much, with his 46 points, 7 boards, and high intensity, he showed every owner out there that he is someone you build a franchise around. And all this while playing for the worst friggin' team in the league. Let me just warn the fans of OKC...ya better bring in some players quick, cuz all good people want to be around good leaders and they can only wait so long to make a move. I would personally like to thank Mr. Durant, for he reminded me that there are a few athletes out there grateful for what they do! Even though Durant gets beat up and bent over almost nightly with his supporting cast, I haven't seen him take up thumbsucking and whining. To check out Teasin' T-Bone's pick of the day, click below! Elisha like the Longhorns in road colors, shouldn't you? The Buffs have proven that they don't have the talent or the depth to make it through the duration of the Big 12 season. With a recent 28 point thumping against their close cellar-dwellar friends the Cyclones, it became very apparent to me that they have given up on the roundball in Boulder, and are just focused on finding the best Kind Bud. As for the Horns, they are fighting for a top 4 seed in the Big 12 tourney, which will keep them a little fresher for the big dance and up their overall stock. Hook 'em Horns...they roll by 16-19! Make sure your girl wears Valentine Red today...and the beads aren't a bad touch either! Take it light fellas. This page contains a single article from February 14, 2009 5:47 AM. The previous days article was Friday Night Gambling Picks & Hotties. The next days article was ACC HOOPS HANDICAPPING.